SKU: SC-BTT270. Categories: AV Products, Home Entertainment, Home Theatre. The SC-BTT270 is the 5.1-channel version of the 2.1-channel , but despite the increased number of speakers it still won’t take up much extra space in your living room. That’s because the supplied satellites are extremely compact, with each one measuring 80(w) x 117(h) x 70.5(d)mm. That makes them easy to accommodate on bookshelves and other furniture in the room, a far cry from the tall space-hogging towers supplied with the upmarket SC-BTT775 system. They also look very dashing in their glossy black finish and slightly curved sides, with a meshed front panel concealing the single full-range driver within. The plasticky back section and springclip terminals remind you this is a budget home cinema system, but on the whole build quality is solid. You also get a centre speaker in the box, which is slightly larger than the other satellites and lies horizontally. The subwoofer is the same passive affair supplied with the SC-BTT262, complete with its gloss-black front panel and compact dimensions of 145(w) x 289.5(h) x 258(d)mm, which, like the satellites, makes it easy to accommodate. The speakers are styled to match the main Blu-ray player/receiver unit, which also boasts a black finish and measures a ridiculously slim 38mm high. In fact, looking at the unit you’d be forgiven for thinking it was just a player – this slimness is mostly down to the use of a space-saving Clear Sound Digital Amplifier. There’s also a pleasing lack of clutter on the fascia – apart from a couple of buttons along the top, everything is hidden behind a flap that drops down and rises when you open and close the tray. Lurking behind here are an SD card slot, USB port, a couple of other buttons and the illuminated display. The right hand side of the fascia is given over to a built in iPod/iPhone dock, which pops out when you press the panel. 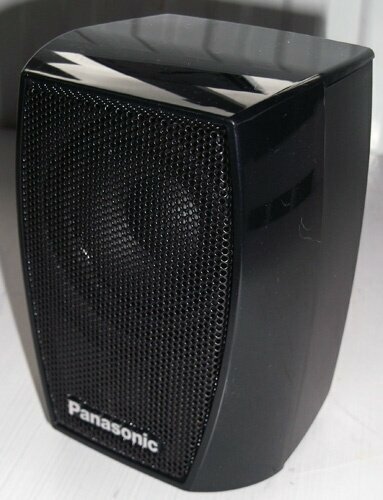 This has always been one of the best things about Panasonic’s systems, providing a much more elegant iPod solution than simply throwing a detachable dock in the box. The rear panel is a bit more interesting than the SC-BTT262, but like its 2.1 sibling you don’t get any HDMI inputs for external equipment. 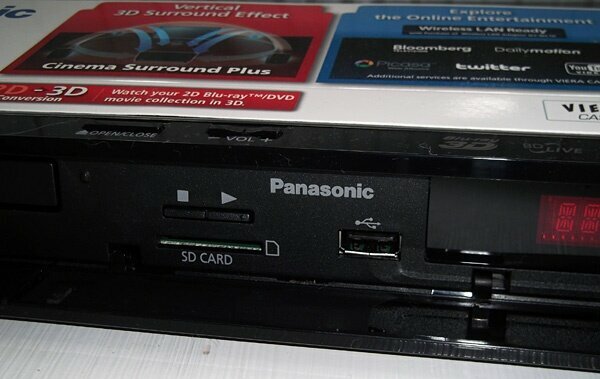 This time you do get a second USB port that allows you to connect Panasonic’s DY-WL10 wireless LAN adapter (802.11a/b/g/n), which could be a godsend if the thought of running an Ethernet cable round the room to your router fills you with dread – although at around £80 it’s not a cheap solution, and you can’t use a cheaper alternative. Also on the rear panel are an optical digital audio input (perfect for Sky boxes), analogue stereo input and composite video output, plus an Ethernet port and FM radio antenna input.